If you haven’t been to The Reel Life in Santa Fe in awhile, they moved next door. In what amounted to a quickie, we spent a day-and-a-half on the ground in Santa Fe, New Mexico, this week and managed a short visit with Toner Mitchell at the Reel Life Fly Shop. I hadn’t been by in awhile, so I immediately did a double take, as they switched locations with their neighbor, and moved into am smaller, more intimate spot. And one of the bigger draws, even though the town is full of great bookstores, Borders Books, is gone with the wind. “We like the new spot. We used to get walk through traffic in the other location, and people stopping in because they were headed to Borders. 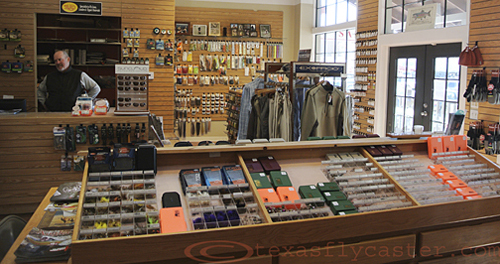 Now we are more of a destination fly shop. 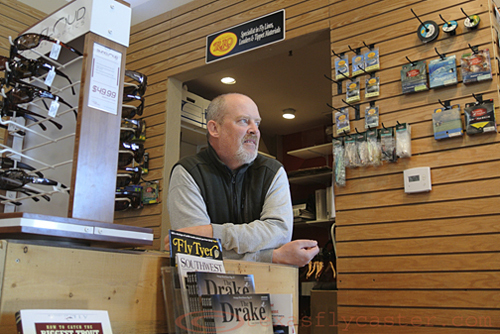 People are coming in to the fly shop because that’s where they intend to go,” Toner said. Just like Texas prairie lands that were burned to a crisp, the areas burned by New Mexico’s wildfires are enjoying a rejuvenation, “They are measuring the nutrients in the soil after the fire, and it obviously did a lot of good (the fires),” he said. 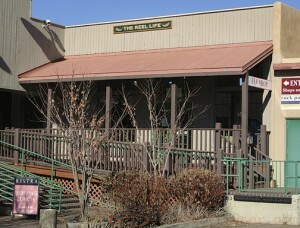 Toner Mitchell, operations manager at the Reel Life in Santa Fe, New Mexico. It’s also easy to forget that important wilderness areas around Santa Fe were heavily damaged by fire last year. Toner tried to put it into perspective, “I was worried about you guys (Texas) because if it was this bad here, it must have been worse there,” he said. They were also concerned about the economic impact the fires would have on their guided trip bookings, but it held steady for awhile. “As the fires burned for weeks, the cancellations started coming in,” Toner said. 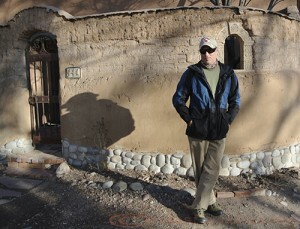 Toner went on to say that there was one other silver lining to the fires in New Mexico last year. “We had the same thing going on here that is going on in national politics. Our State politicians were polarized and nothing was happening,” Toner said. However, the fire, and the extent of the physical and economic destruction brought both sides together to agree and cooperate with economic relief and a good hard look at the reasons why the fires happened, and how to prevent it from happening again in the future. As for the Reel Life, the change of ownership, and their business; Toner thinks the change of hands was a good thing, and although their morale took a bit of a beating in 2011 (guys coming in all the time and asking if there were closing), he is looking forward to 2012. “We’re going to have seven guides this year,” and there doesn’t appear to be any residual effects from the fires. “Guys got their fish last year, after the fire,” and Toner doesn’t see any reason why it wouldn’t be just as good this year. While much of the focus in New Mexico fly fishing is on trout fishing and trout habitat (we talked at length about the project at the Navajo Quality Waters), Toner gets a spark when talking about catching pike in the Rio Grande. “The big ones are coming out right now. It’s pre-spawn. It’s a sight fishing thing too, just like carp on the flats,” he said. According to Toner, you may just see a little flash of pink that gives them away. Once you spot them, it’s a cat-and-mouse game of tempting them into the take. I have to get some of that. For those of you unfamiliar with Toner Mitchell, he just had an article run in the November-December “Southwest Fly Fishing” magazine – “Chama River, NM El Vado Stretch,” and has something coming out soon on the Rio Grande pike fishing. He’s also president of the Truchas Chapter of New Mexico’s Trout Unlimited.